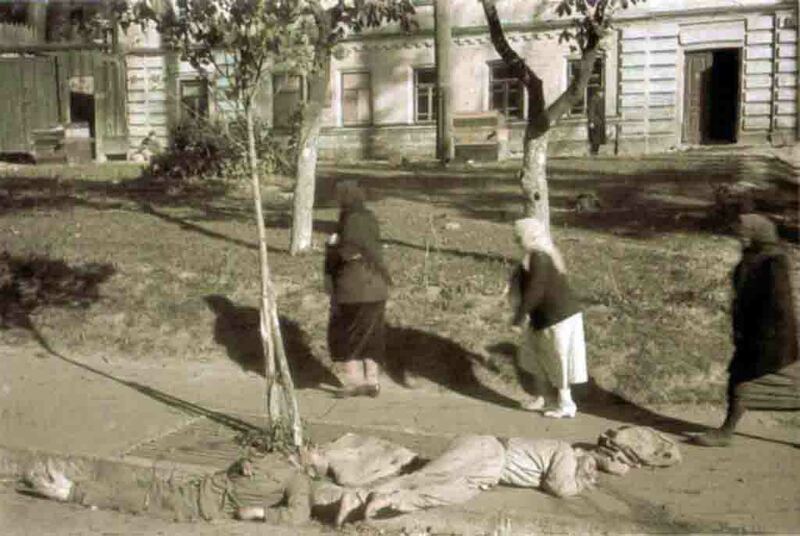 The bodies of the killed Russian prisoners of war lay unburied on the streets of the Nazi-occupied Kiev. One of them is dressed in a tunic and riding breeches, the other in only underwear. Both prisoners of war without shoes, bare feet in the mud – went barefoot. The dead Russian prisoners of war – exhausted faces. Eyewitnesses recall that when the prisoners were being driven along the streets of Kiev, the escorts shot those who could not go on. The photo was taken 10 days after the fall of Kiev by the German military photographer Johannes Hale, who served in the 637th company of propaganda, which was part of the 6th German army, which seized the capital of the Ukrainian SSR.